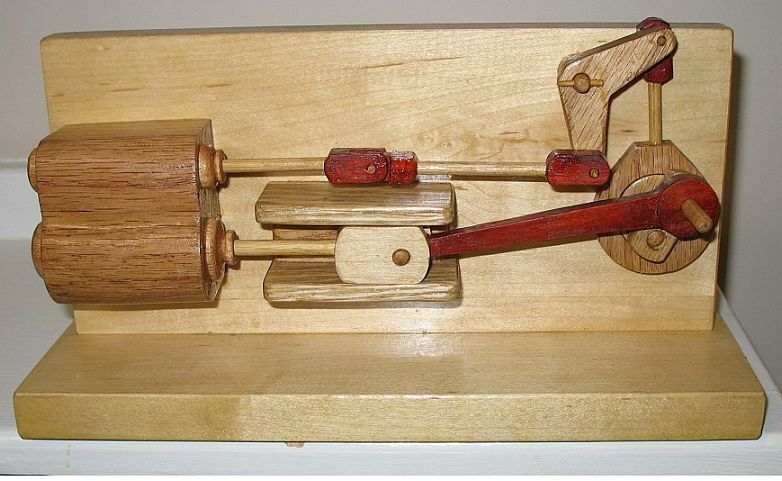 Back in 1991, I bought the book Making Mechanical Marvels in Wood by Raymond Levy. It sat on my book shelf from 1991 until Christmas 2007. I decided to try making one of the 15 models in the book. I selected the U-joint model. I took this model to work, and everybody who stopped by my desk...mostly engineers..had to crank it and play with it. Here is a short video showing my Son Jacob operating this wood model. I am going to make a more colorful u-joint model, see this link for more details. I forgot to take a picture of my model..but here is a similar one except that mine is centered on the back plate per the pattern in the book. 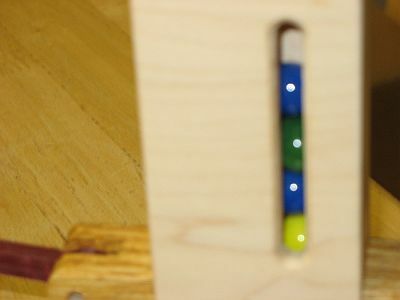 Below is a video showing this wood model in action. This was the hardest model to build, due to the many small pieces required. 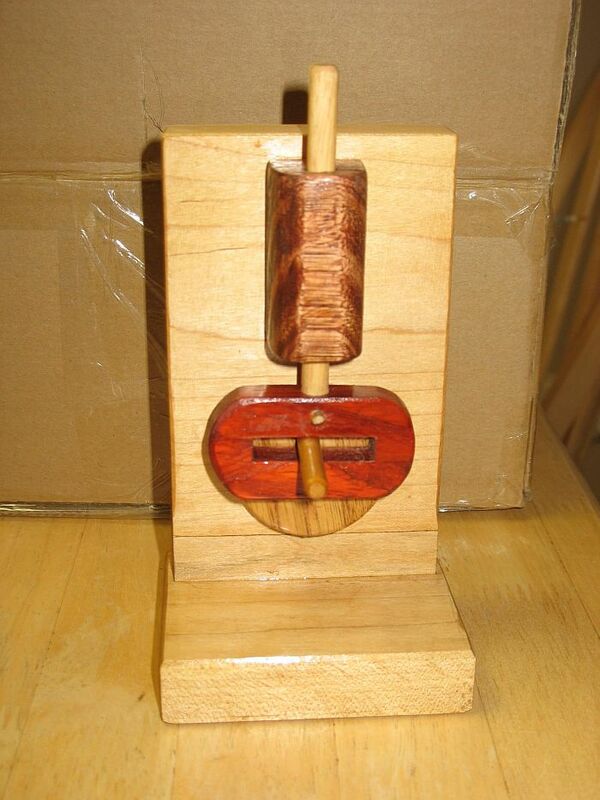 Here is a link to a review I did on Rockler that won project review of the week. 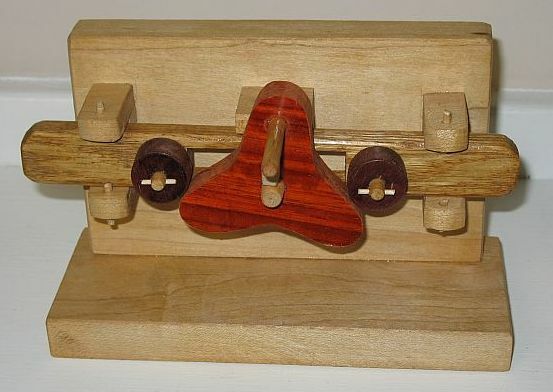 This was a challenging model to build. There are many small pieces in the marble holding tower that you can't see. 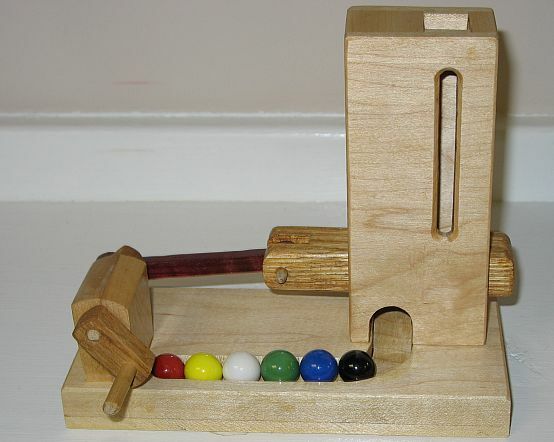 It is one of the most popular models for people to play with...it is fascinating to watch the marbles come out as you crank it. I was amazed that drilling out the gear roots and bandsawing the gear teeth was acceptable for this model. I assumed much hand filing would be required. I did experiment and get the optimum gear centerline spacing so they would run freely. It is totally amazing how frictionless this 2:1 speed reducer mechanism is. It is also fascinating to watch the 3 small wheels engage and disengage the big slotted wheel. I decided to enter the design into Google Sketchup, then liven it up with some red and purple wood colors. As soon as I get the more colorful model built, I will post photos here. 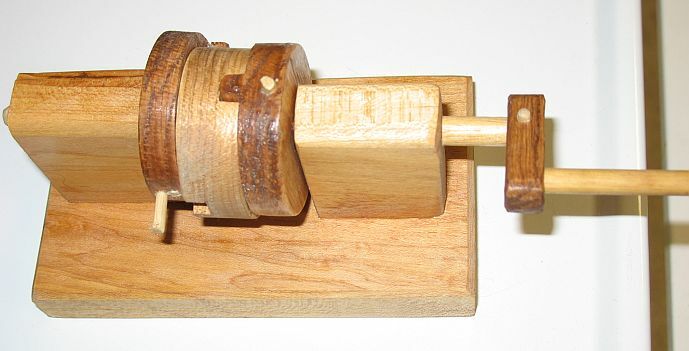 I have had wood axles for attaching wood wheels to projects in storage since the 1980s, when I last made some wood toys with wheels. 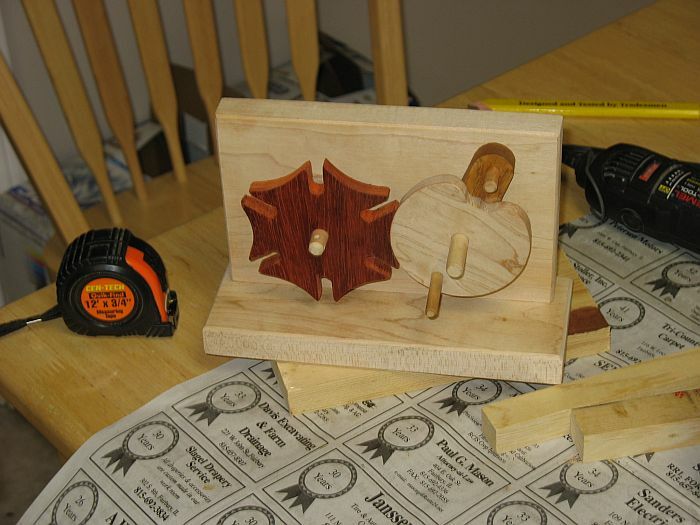 I was able to incorporate them into this project as u-joint pins...and they add a nice touch compared to straight dowels. Johnson's Wax makes this model run very smoothly. 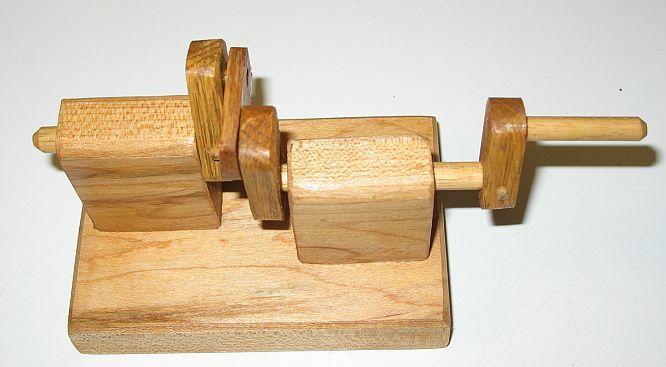 The u-joints themselves are very fragile, because there is almost no cross-section left in them. Do not force the dowel pins into the u-joints, or the shaft dowels...because you will split the u-joint and have to glue it back together! My nephew, Brian Munz, was killed in the line-of-duty as a volunteer fireman. An auction is going to be held to raise money for a new firehouse. 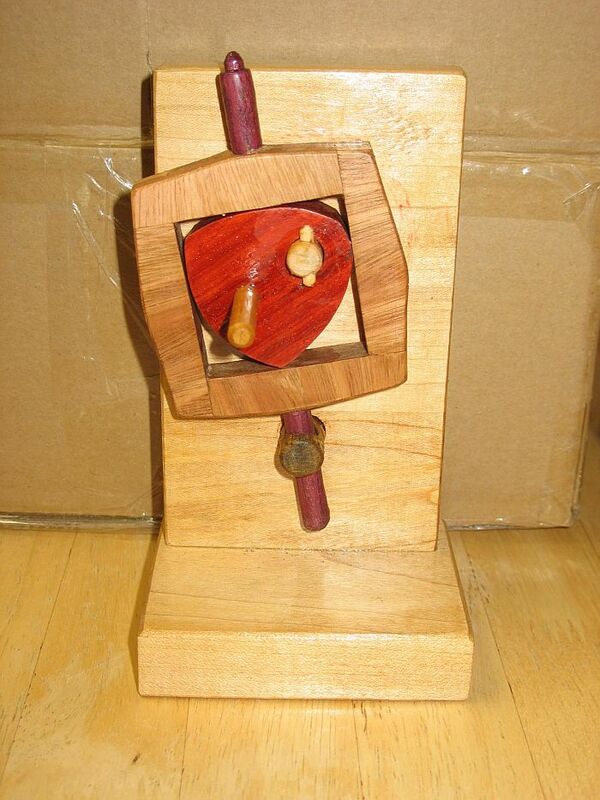 I decided to make another colorful u-joint model and donate it to the auction. Below are photos of the finished model. I decided to make a 2nd copy of this model, and give it away as a Christmas present. 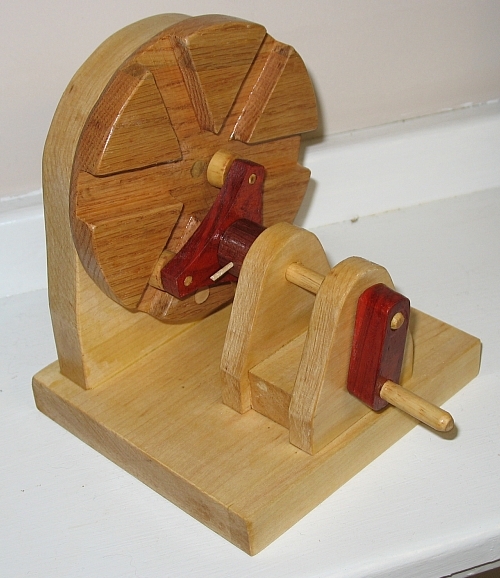 I used oak again for the slotted wheel, but decided to not stain it like the 1st copy. I thought the oak was too dark on the 1st copy. 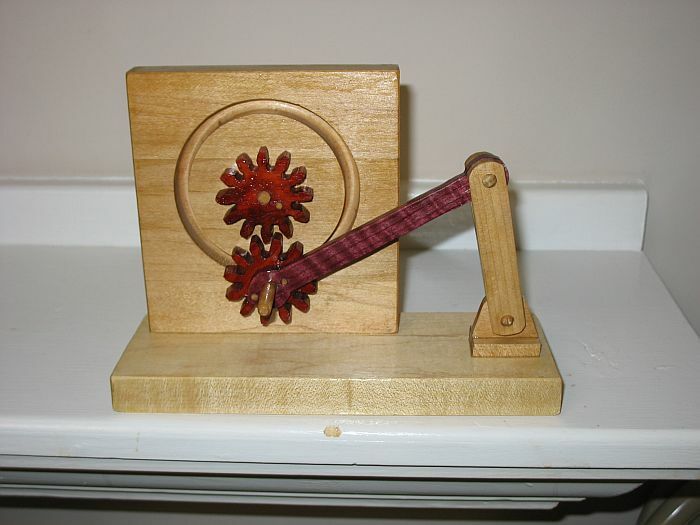 I also changed the wood type on the crank link from oak to paudauk to give it more color. 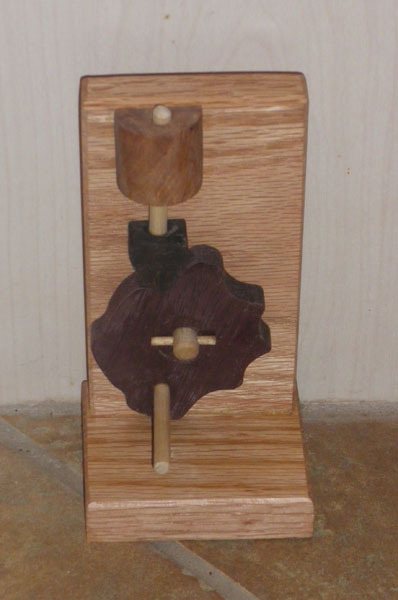 As I was making the slotted wheel, I forgot to make the slots slightly wider than the plan, which I did on the 1st copy. The wider slots give plenty of clearance for the 3 small wheels to ride in. 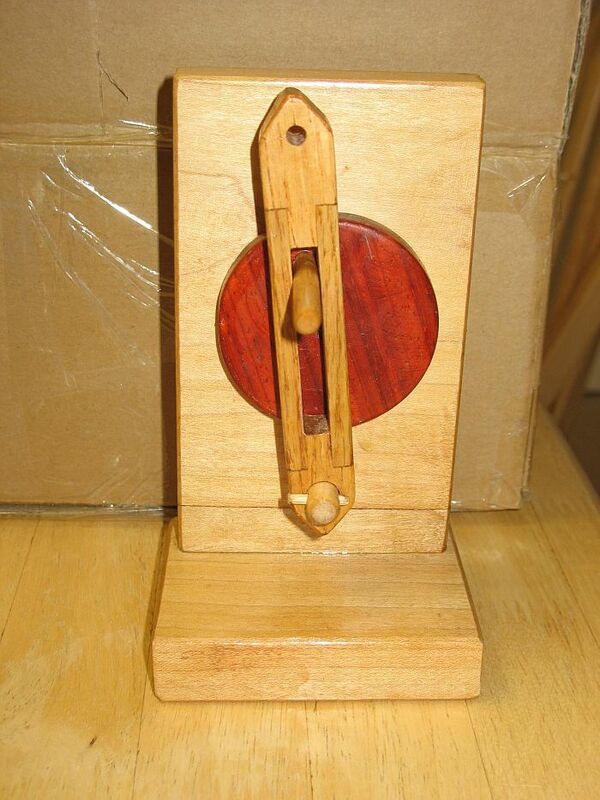 I had to use the Dremel with 1/2" drum sander to widen the slots. 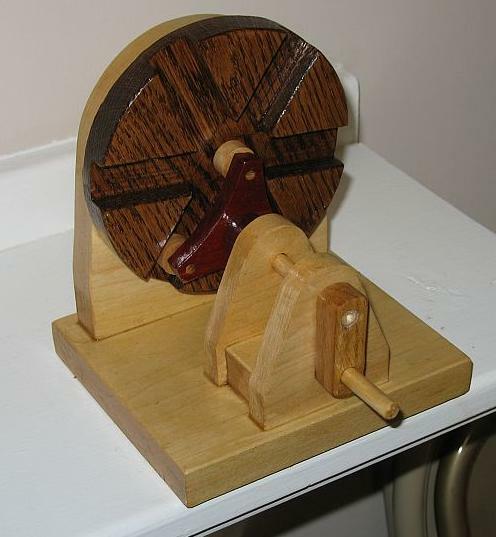 I added a 3/8" diameter insert of maple on the slotted wheel so you can easily count the revolutions on the slotted wheel while it turns. 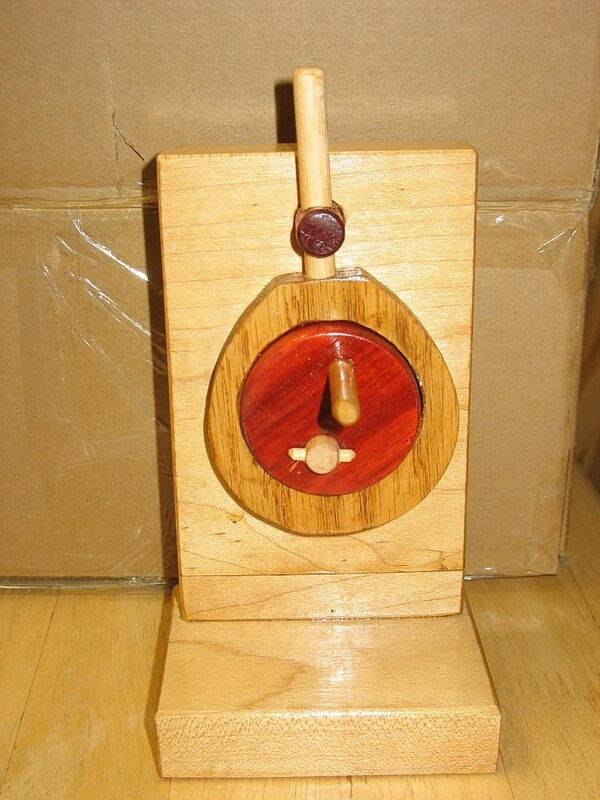 Choosing padauk or purple heartwood for the insert would have given more of a color contrast than the white maple (the white maple gave a good contrast on the 1st model with its dark stained oak, I forgot I was making 2nd model slotted wheel without stain and it would be much lighter.